When I saw this recipe in a recent issue of Cooking Light, it caught my eye for a couple of reasons. The first being that it was a 5 ingredient recipe. That meant it would be easy to prepare and I could probably throw it together with things I had on hand. The second reason it appealed to me was because it called for 2 cups of basil leaves and I had at least that amount of basil growing like mad outside my front door. I wanted to get the most out of my herbs that I planted, so I decided to make this for dinner. I found some swordfish for a great price and even checked Seafood Watch to make sure that is was an okay choice since I know there are concerns about certain fish, the way the are caught, the supply, etc. For my area, swordfish is an "good alternative". 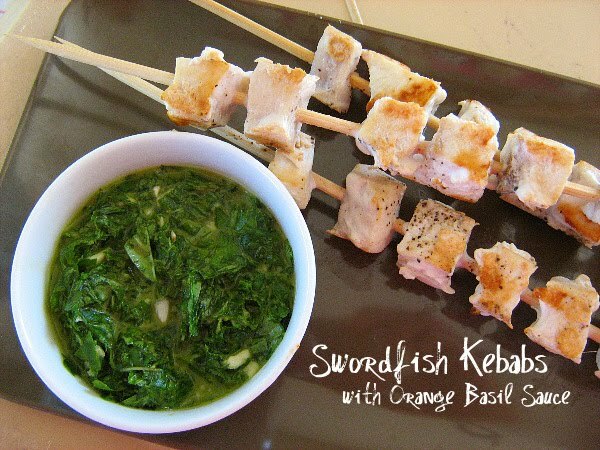 If swordfish is not a good choice for your area or you can't find it- you can sub any other firm white fish. I really liked this sauce. I liked the fact that it didn't contain much oil, so it was lighter than pesto and the orange gave it a nice kick of flavor. I grilled these on my indoor grill and my kids really love eating them. I love summer. The heat doesn't bother me that much and I would definitely rather be hot than cold. I know there are many people out there who completely disagree with me and I happen to be married to one of them. Anyway, the weather here in Georgia seems to have taken a turn for the hotter, which goes hand in hand with more humidity. The past week has been pretty sticky and hot. This type of weather means that cold refreshment is absolutely necessary. 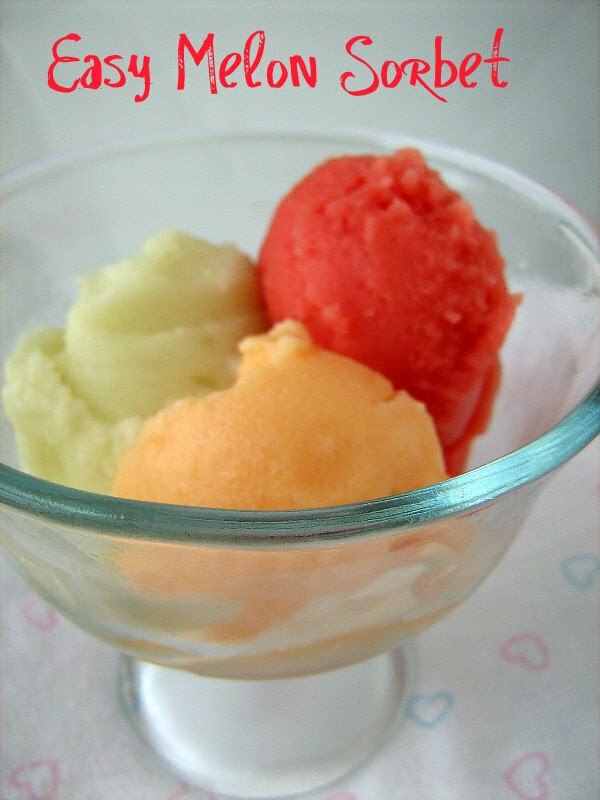 I saw this recipe/idea for Easy Melon Sorbet and the picture looked so refreshing that I went out and bought a canteloupe, a honeydew melon and a watermelon. It turns out, it really was that easy. Not that making sorbet it difficult, but this one doesn't even include a simple syrup, so there are only a few steps. I cut up my melons, froze them in a ziploc bag and then pureed them, the following day. I had to add a Tablespoon or 2 of water to each batch of melon, to help smooth it out, but my melons were so sweet and tasty that I didn't add any sugar to them. 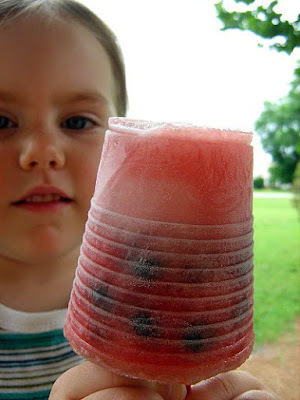 We loved this easy frozen melon treat. I actually finished it of last night and it was so delicious. The other little drink came about when I had some watermelon cubes and we wanted a frosty/slushy drink, so I decided to combine the watermelon with some frozen strawberries I had on hand and it turned out really delicious. Enjoy this frozen fruit dessert without a lot of bother or even an ice-cream maker. All you need are a few fresh melons and a food processor. First, cube a melon and freeze it in a food-storage bag. When you're ready to make sorbet, place frozen melon in the food processor, and puree. You may need to add water to smooth. Add sugar to taste, and puree again. 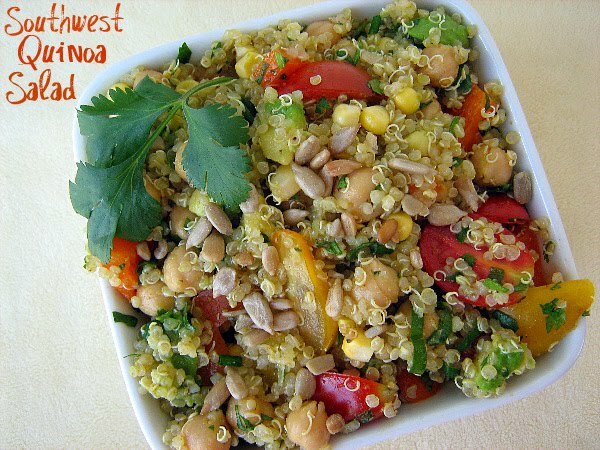 Serve immediately, or store in the freezer in an airtight container up to 2 weeks. 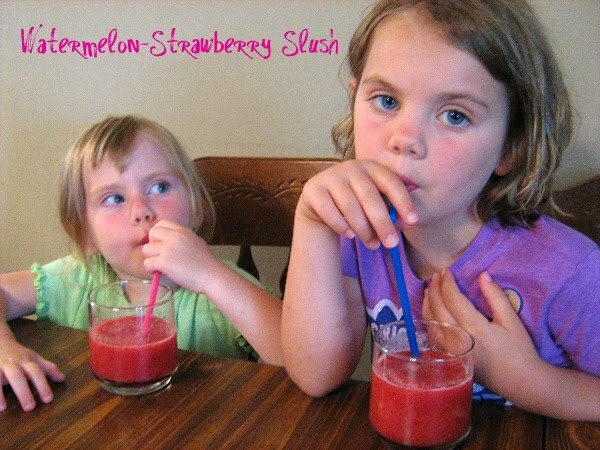 Place watermelon cubes and frozen strawberries in the food processor or blender and process until blended and slushy. Pour into glasses and serve. 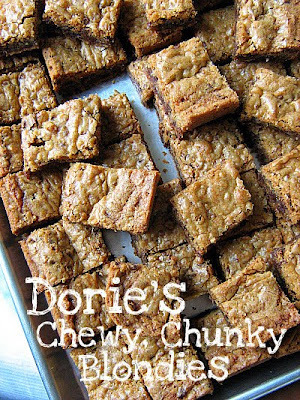 Nicole chose this week's TWD recipe, Chewy, Chunky Blondies. You can find the recipe on her blog- Cookies on Friday. You can also find the recipe on a post from when I made these a couple of months ago- when we were taking dinner to a local homeless shelter. I doubled the recipe to make sure that there would be enough to go around and they were wildly popular. My husband was lucky enough to taste one and he was wishing that there were more to sample. I used Heath bits, pecans, and toasted coconut in my blondies. 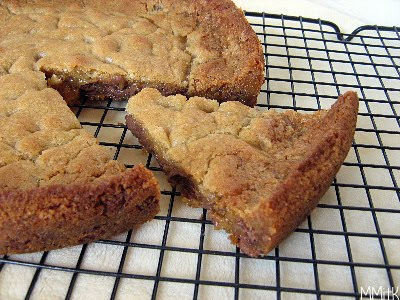 Check out the TWD blog to see who else loved these blondies! 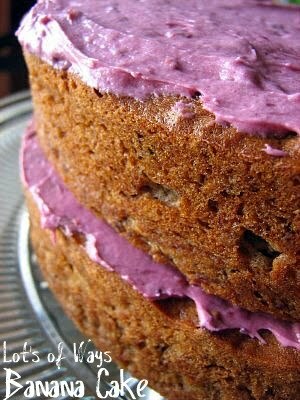 I know in my last post I said I don't like cooked fruit in desserts, but cake sometimes can make me change my mind. I made this for our 4th of July dinner, along with the cherry tart. While the overall flavor was good, I had a few problems with the way this turned out. The recipe says to prepare this in a springform pan and then to bake it on a baking sheet, in case any juice happens to leak out of the pan. The problem is, that all the juice leaks out of the pan. The sugar/butter mixture that is supposed to stay at the bottom of the pan and get all nice and caramelized when it combines with the juice from the fruit, well, unfortunately, it all wasted away and got stuck to my cookie sheet. The cake still tasted good, but the fruit was definitely missing the "upside-down" part of the process. 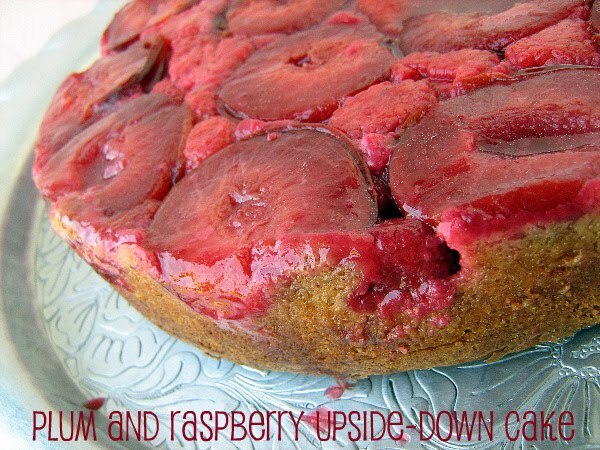 So, if you are going to make this, I would suggest using a tall cake pan, with at least 2-inch sides. And to make sure the batter fits on top, I would suggest a 9-inch pan. I was slightly disappointed with how this turned out, but the cake has a fabulous taste and lots of potential. I am not a big fan of cooked fruit in desserts. 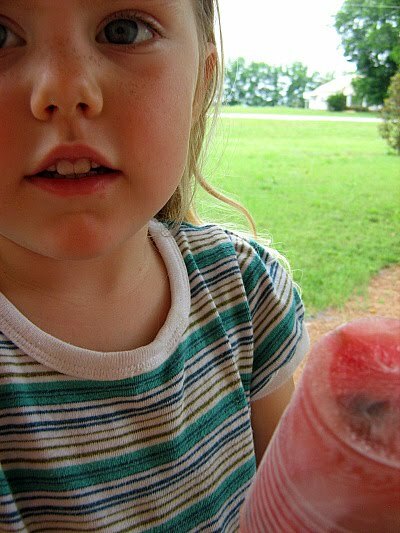 I prefer to eat my fruit fresh, especially in the summertime. 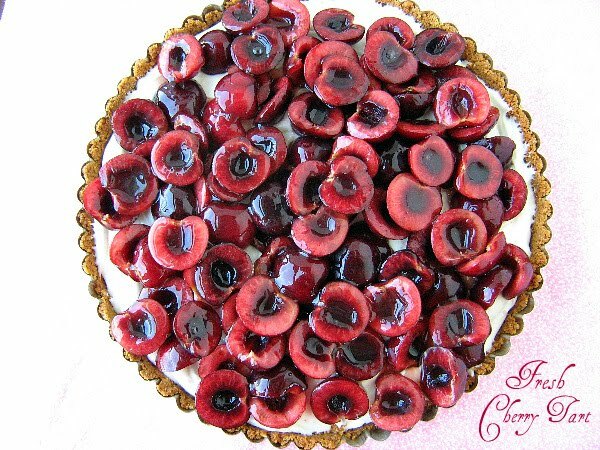 I wanted to make a dessert for the 4th of July and really wanted to use sweet cherries, since they were ripe and at a great price. My husband loves cherry pie, but I just couldn't bring myself to cook these beauties. They were so sweet and delicious. I searched for a way to serve them fresh in a dessert that would let them shine in all their beauty. I found the perfect recipe in this Fresh Cherry Tart. It has a basic graham cracker crust and then a cheesecake-like filling, that doesn't require any baking time. The cherries are pitted and halved, then glazed with a small amount of thinned jam. This tart was absolutely perfect. Crowd pleaser, beautiful and delicious. (which she has kindly left up so people can still use her recipes) but, I really, really love her new blog- Fresh Clean Start. It's all about getting to a healthier place and I absolutely love every single post. When I saw her post about this Quinoa Salad, I could not wait to put it together. I made this salad for our 4th of July get-together and since the recipe written was enough to serve 1-2 people, I at least quadrupled the salad ingredients, so that everyone could have some and hopefully there would be some leftover for me to eat for lunch sometime during the next week. I cooked up a bunch of quinoa (something I always do, so that there will be enough for whatever I need during the week) and started chopping my veggies. I used fresh corn on the cob that I got from the Farmer's Market and I also used some heirloom cherry tomatoes. I added cumin, chili powder, paprika, and lime juice- tasting it along the way- until it was just right. I really didn't know how well it would be received at our dinner, but many people really, really liked it. This made me happy, but also limited the amount of leftovers. Luckily, there was enough leftover for lunch one day and I served it over a big pile of salad greens as Lindsey suggested. This really is so, so good and good for you. I can't wait to make a big batch of it again. I planted some mint in a pot outside my front door a couple of months ago and it is trying to take over the front steps! This was one of the recipes that I wanted to try from a recent issue of The Food Network Magazine and since I had all that mint, I decided it would be a good way to some of it up. We had this for our Father's Day dinner and it was pretty good. The limes that I purchased for this weren't very juicy, so I had to really work to get enough lime juice. It was really strange, how hard the limes were. I thought I had seen a tip from somewhere about warming the limes in the microwave and rolling them on the counter to get more juice out of them. That technique did work, but it made for a very hot, lime-y mess. The flavors in this were pretty strong, so we added lots of ice. It's nice to have a cold, flavorful drink every once in awhile and this was definitely flavorful. This week's selection for Tuesday's with Dorie- Lot's of Ways Banana Cake, was chosen by Kimberly who blogs over at Only Creative Opportunities. You can find the recipe for this versatile, delicious cake on her blog. I have made this cake many, many times and posted about it twice. It was one of the first recipes I tried from Dorie's book. 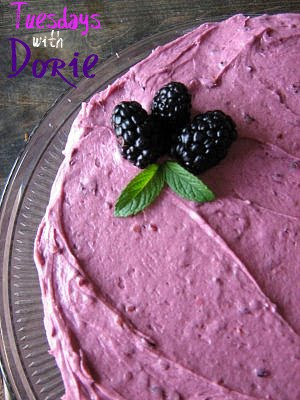 I made it once as a layer cake with Blackberry Buttercream. That was for my going away party when we moved from Utah to Georgia last year. 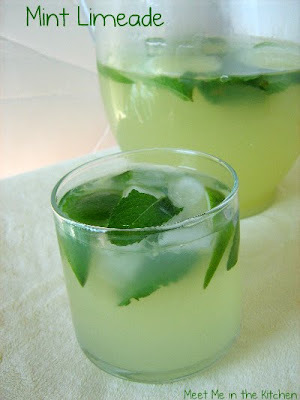 It is so simple and there are quite a variety of ways that you can make it based on what ingredients you have on hand. It is definitely a great way to use up ripe bananas and I will make it again. Check out TWD to see who else made this cake and what they thought about it! Recently, I saw a recipe for zucchini-potato hash, topped with a fried egg in a magazine when I was checking out at the grocery store. It looked really good, so I decided to make my own version, since I couldn't find the recipe online anywhere. I used little red potatoes because they have a better flavor than other potatoes and they are small, so they are easy to cut and they cook quickly. I also used zucchini and yellow squash that I got from the Farmer's Market. I decided to roast all the vegetables in the oven. I put the potatoes in first and then the squash, since the potatoes took a little longer to roast. I topped it off with a fried egg and had some sauteed swiss chard on the side. Place potatoes on a rimmed baking sheet. Drizzle with 1 Tbls olive oil. Season with oregano, salt and pepper. Toss to coat. Roast in oven for 20-25 minutes or until tender, stirring halfway through. Place zucchini and yellow squash on another rimmed baking sheet. Drizzle with 1 Tbls olive oil. Season with oregano, salt and pepper. Toss to coat. Roast in oven for 10-15 minutes, until tender, stirring halfway through. Meanwhile, heat a tsp of olive oil in a small skillet. Crack open an egg into hot oil. Season with salt and pepper. Cook until desired doneness, flipping over halfway through cooking. Repeat with other eggs. 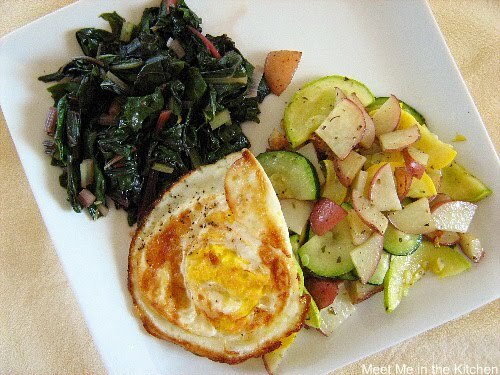 When all vegetables are roasted and tender, toss together and top with a fried egg. I cooked my swiss chard using this recipe/method. When I was visiting my sister in DC, she was really excited about her new Ice Cream Maker that she gifted to her husband for Father's Day. She wanted me to show her how to make custard, so that she could make gelato. She also purchased a great book and picked this Key Lime Pie Gelato, as the first gelato to try. Making the gelato base was the same as making an ice cream custard- the only difference being that there is more whole milk and less cream in this gelato base than a typical ice cream custard. A slight difference, in my opinion. We added more graham cracker crumbs then the recipe called for and made sure to freeze them ahead of time, so they would be completely frozen. This was a really great frozen treat. It really tasted like key lime and everyone loved it. In a heavy-bottom saucepan, combine the milk and cream. Place over medium-low heat and cook, stirring occasionally so a skin doesn't form, until tiny bubbles start to form around the edges and the mixture reaches a temperature of 170 degrees F.
Meanwhile, in a medium heat-proof bowl, whisk the egg yolks until smooth. Gradually whisk in the sugar until it is well incorporated and the mixture is thick and pale yellow. Temper the egg yolks by very slowly pouring in the hot milk mixture while whisking continuously. Return the custard to the saucepan and place over low heat. Cook, stirring frequently with a wooden spoon, until the custard is thick enough to coat the back of the spoon and it reaches a temperature of 185 degrees F. Do not bring to a boil. Pour the mixture through a fine-mesh strainer into a clean bowl and let cool to room temperature, stirring every 5 minutes or so. To cool the custard quickly, make an ice bath by filling a large bowl with ice and water and placing the bowl with the custard in it; stir the custard until cooled. Once completely cooled, cover and refrigerate until very cold, at least 4 hours or overnight. Now churn in your ice cream machine, according to directions. 3/4 cup crushed graham crackers, frozen. Transfer to a container and freeze, until firm enough to scoop. This is another dish that we had for our Father's Day dinner that I made because I knew my kids and husband would love it. I used the same basic recipe for roasting the shrimp that I used a few months ago. I just added some different flavors this time around. My friend that was visiting with us doesn't like shrimp, but she was intrigued by the fact that I roasted the shrimp, so she decided to try one. She loved it! She said it was the best shrimp and that roasting it completely changes the texture and makes it firm and delicious. We also made this when we went to DC for our visit and it was loved by my sister and her family as well. Place the shrimp on a sheet pan. Drizzle them with olive oil and lemon juice. Add the minced garlic, chopped parsley, and season with salt & pepper. 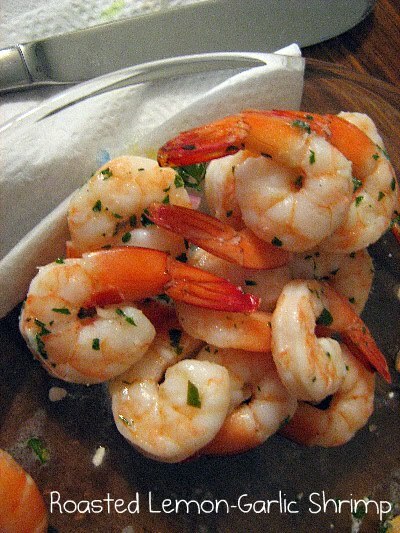 Toss together with your fingers and arrange the shrimp in a single layer. Roast for 8 to 10 minutes, just until pink and firm and cooked through. For Father's Day, I asked my husband what he wanted for dinner and he said I could make whatever I wanted. So, I tried a few recipes that I had been wanting to try, but I decided to make a dessert that I knew my husband would absolutely love. He loves chocolate chip cookies. He likes them with milk chocolate chips and he likes to eat the dough. Total opposite of me. I couldn't care less if I ever ate another chocolate chip cookie and you couldn't pay me money to eat cookie dough! 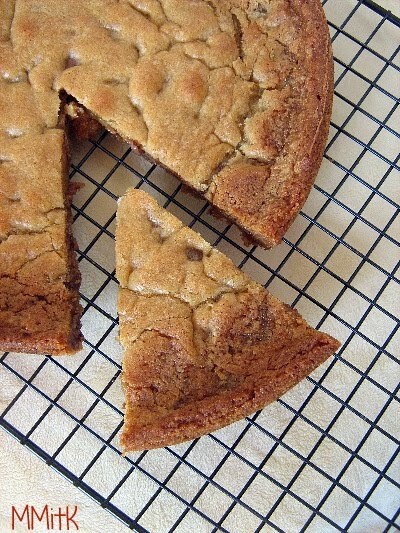 I knew that this Chocolate Chip Cookie Cake would be the perfect dessert. It is basically just chocolate chip cookie batter that is baked in a cake pan. But, it isn't completely cooked. When you pull it out of the oven, the top will be brown, but the middle will be loose. I actually put it back in the oven for a couple minutes because the middle was so wet, but it is supposed to be like that because then you let it sit for 4 hours and when you cut it, the texture is like a cookie that has just been pulled out of the oven. My husband LOOOOVVVED this dessert. His exact quotes were "this is the best thing you have ever made" and "could we always have this available to eat at our house?" He had it topped with a scoop of vanilla ice cream and then I sent the leftovers with him to work the next day in his lunch. He said it was just as good the next day. I didn't even try it, mostly because a warm, gooey cookie doesn't appeal to me, but my friend who tried it, confirmed that it was one of the best desserts ever. The kids agreed. If you know a chocolate chip cookie lover, you must make this for them as soon as you can! ** The 4 hour wait before eating is essential, so that the cookie cake can set up the way it is supposed to! Using a stand mixer or a hand mixer, cream the butter, light brown sugar, and vanilla extract on medium speed until well combined, about 1 minute. Increase the mixer speed to high and beat for 15 seconds. Stop the mixer, scrape down the sides of the bowl, and add the egg. Add the chocolate chips and mix for a few seconds until combined. Press the batter into a smooth and even layer in the pan. Bake until lightly golden and puffy around the edges (the center should still feel quite soft), 18 – 22 minutes. Cool for 10 minutes and then run a paring knife around the edge of the pan to release the cake. I found the most gorgeous green, yellow, and purple beans at the Farmer's Market. 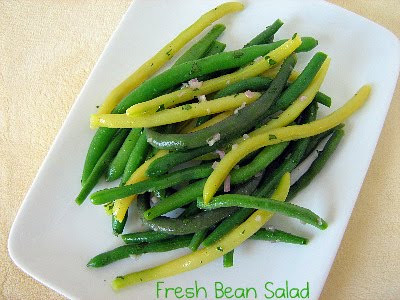 I wanted to really showcase the fresh flavor and keep them as crisp as possible, so I found this recipe that just quickly blanches the beans and then dresses them with a very simple dressing made of shallots, fresh lemon juice, dijon mustard, and olive oil. The key to making this dish so delicious is making sure that you do not overcook the beans. Here are more detailed instructions about how to properly blanch green beans. If done properly, the beans will be nice and crisp and delicious. I was a little bit sad that my beautiful purple beans lost most of their color due to the 3 minutes in boiling water. The taste was wonderful though. This is the my favorite recipe for fresh green beans. Tuesdays with Dorie is brought to you today by Karen, who blogs over at Welcome to our Crazy Blessed Life. 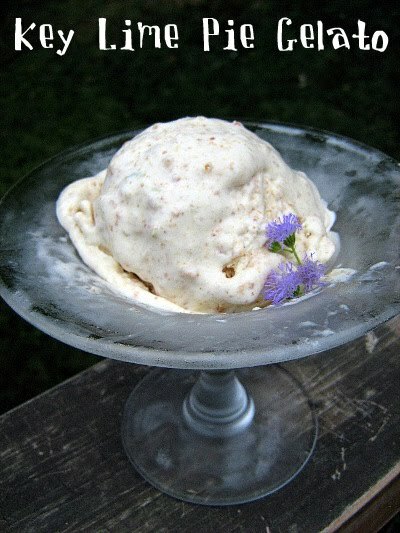 You can find the recipe for this week's recipe, Brrrrr-ownies, on her blog. 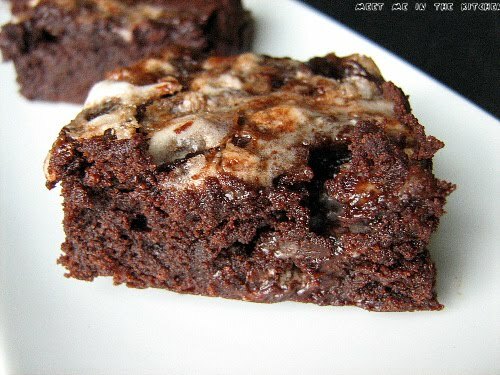 Brrrr-ownies happen to be Dorie's take on a brownie that is chock full of chopped Peppermint Patties. I wasn't going to make these, mostly because I have made something very similar- Martha Stewarts Mint-filled Brownie Cupcakes, many, many times (my son requests them all the time) and also because I could care less about brownies. But, when I asked my kids what treat they wanted for our weekly Family Home Evening, my 8 year old son yelled out "Peppermint Brownies" and he had no idea that these were the assignment for this week. He just loves brownies. So, we went to the store and bought some York Peppermint Patties and threw these babies together. I skipped the double boiler method and just melted my butter and chocolate on the stovetop. That is how we always made brownies when I was growing up, so I figured it would be fine. I also used semi-sweet chocolate instead of bittersweet, because that is what I happened to have on hand. Because I used semi-sweet I reduced the sugar in the brownie by quite a few Tablespoons. I mixed up the rest of the batter, added the chopped patties and smoothed my batter into the foil-lined pan. I skipped out on the butter and just used baking cooking spray with flour to coat my foil. These brownies were like volcanos! The mint blobs were bubbling and exploding like crazy. We turned on the oven light and watched. Great entertainment. My kids loved these. They reported that they were chewy, gooey, sticky, and delicious. Honestly, I would rather just eat Peppermint Patties, but I don't like brownies, so who am I to judge? To see who else participated this week and what they thought about these Brrrrr-ownies, check out the TWD Leave Your Link for this week! I absolutely love going to the Farmer's Market. A couple of weeks ago I was lucky enough to get one of the participants' last bunch of chioggia beets. I was so excited, I could hardly stand it. It was the day before father's day, so I knew that I would be working these beets into the menu somehow. I love beets cold or warm, raw or cooked, so I was looking for a interesting, new way to serve them. 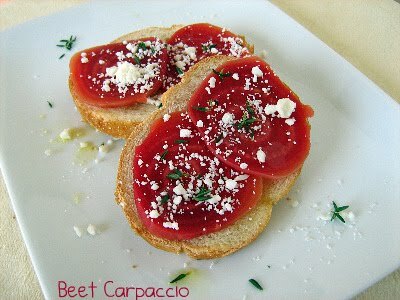 I don't remember exactly how I found this recipe for Beet Carpaccio, but it looked delicious and I knew it would be a fun way to enjoy our beautiful beets. This dish has you boil the beets until slightly tender, then the beets are thinly sliced and layered on toasted baguette slices. Cheese, herbs and olive oil are sprinkled/drizzled on top to finish them off. I used feta cheese instead of blue cheese since that is what I had in my fridge and I knew that beets taste really good with feta. I also used fresh thyme as the herb for seasoning. This turned out to be a beautiful and very yummy appetizer. A perfect choice. When my friend was here visiting, we created this simple salad. We found some beautiful heirloom grape/cherry tomatoes and combined them with chopped avocados, lemon juice, olive oil, salt and pepper. It was delicious on its own and we enjoyed it as part of our lunch one day. The wheels in my head were turning though, and the next morning I had an idea for breakfast. I like to get up early and exercise before my kids wake up. I don't eat before I work out, so when I finally get to eating breakfast it is late morning and I am hungry. I don't want a wimpy breakfast. I want something full of protein and fiber that is going to fill me up and do something for me nutritionally. My friend found this Hearty Grain with Flax and Soy loaf at Publix, and basically fell in love with it. 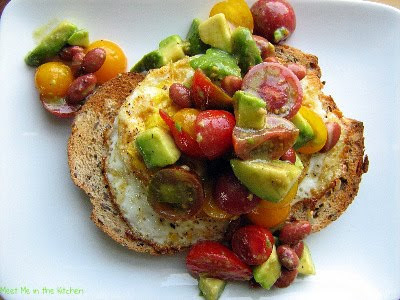 We decided to toast the bread, fry an egg in a little bit of olive oil, top the bread with the egg, then top the egg with the tomato-avocado salad and some pinto beans. Best breakfast ever. It was really so good. 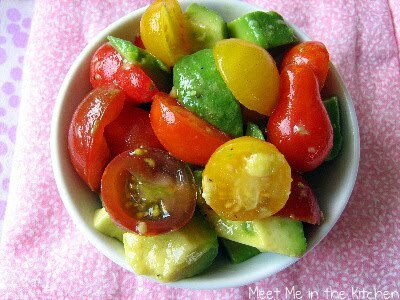 We also made this tomato-avocado salad when we were in DC and used it to top our green salad. We also ate it with tortilla chips. Endless possibilities on this one. Put avocado in a bowl. Toss with lemon juice, to prevent discoloring. Add tomatoes and olive oil. Stir to combine. Season with salt and pepper to taste. Enjoy on its own, on salad, on toast, with eggs, with chips, in a burrito- anyway you want. Watermelon. There is nothing better. I love it so much. It might be a big part of the reason that summer is my favorite season. 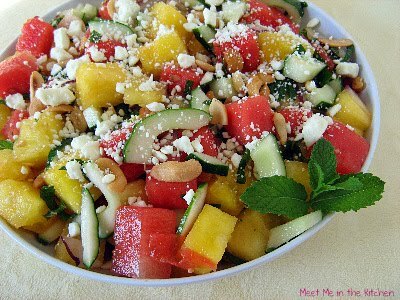 I discovered a yellow watermelon and decided to try it in this salad, along with a red one. I found the recipe in The Food Network Magazine and thought it would be a beautiful + delicious side dish to round out our Father's Day feast. I really like the ingredients in this salad. Watermelon, cucumber, cashews, feta, lemon juice, mint. They all come together and make a very tasty combination. The sweetness of the watermelon is balanced by the crunch and salty flavors that the other ingredients add. Other family members weren't so sure about this salad. Some people in my family are a little bit fussy about mixing certain foods, but everyone gave it a try and it was victorious in a couple of mouths. I was fine with it not being the most popular dish of the day because that just meant that I got to enjoy the leftovers a different day. 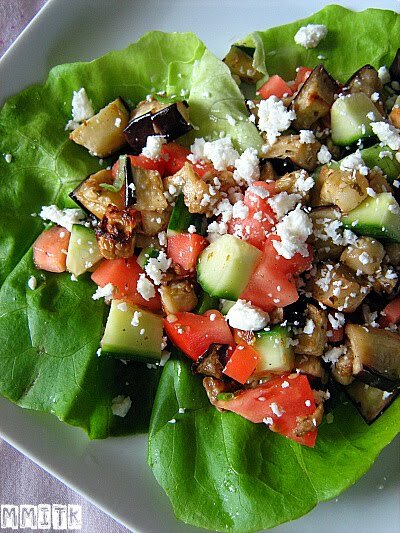 Eggplant is such a versatile vegetable. 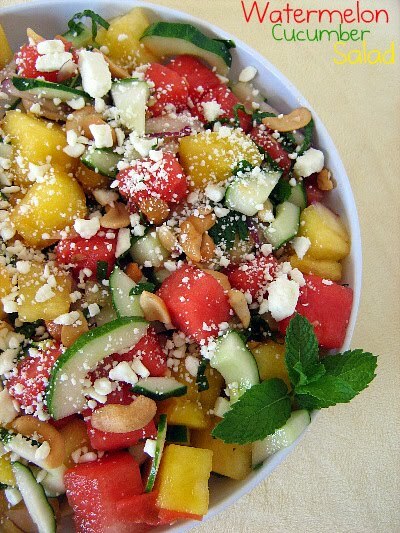 It can take on almost any flavor and I was very intrigued by it's use in this salad. and the picture just looked too delicious to pass up. I really love salads, especially in the summer, so this went on the weekly menu plan immediately. You roast the eggplant in the oven and then mix up a quick vinaigrette. Chop a few veggies and dinner or lunch is ready. I really loved the flavors of the vinaigrette. The tomatoes and cucumbers added a nice crunch to the roasted eggplant. Truly tasty. Me and the kids just got back from a little vacation. One of my best friends was here visiting me and we decided to drive to DC to visit my sister and some other friends. On the way back we went to Savannah and then arrived home yesterday. In DC they were already getting ready for the 4th of July festivities. It reminded me of the great time we had there last year celebrating the 4th. On a side note- my sister took us to eat at Zaytinya in downtown DC and it was fantastic. It features small plates and great flavors. If you are in the area, you should definitely give it a try. A couple of weeks ago I made these Watermelon Blueberry Pops. I had been waiting for a good price so that I could buy a watermelon and the one I finally picked was amazingly delicious. It reaffirmed my belief that I could live on watermelon alone. I saw this recipe in Ellie Krieger's So Easy Cookbook and these popsicles really were just that- so easy. You just have to puree watermelon chunks (making sure you don't eat the entire watermelon in the process) with a little powdered sugar and lime juice. Then you put the mixture in popsicle molds or plastic cups and drop in blueberries. 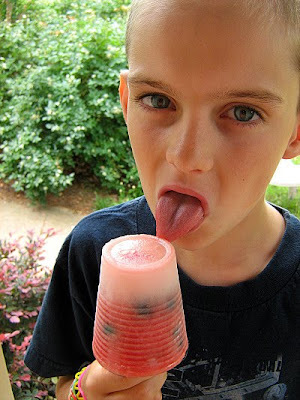 I wish I would have made these in popsicle molds because they were slightly difficult to eat due to the large size. They were still delicious though. 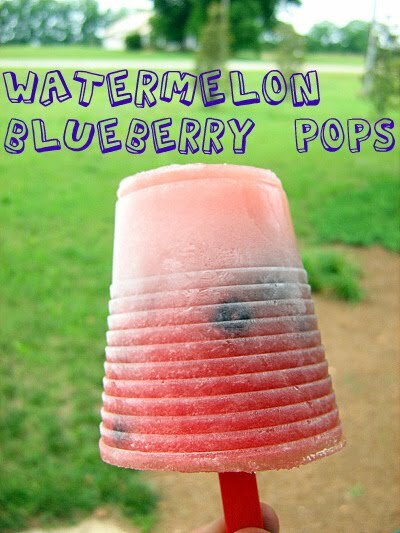 The fun part is that in the freezer a white layer forms at the top of the popsicle and makes this frozen treat truly patriotic looking. Perfect treat for a hot afternoon or sticky summer night! Puree the watermelon, lime juice, and sugar in a blender. 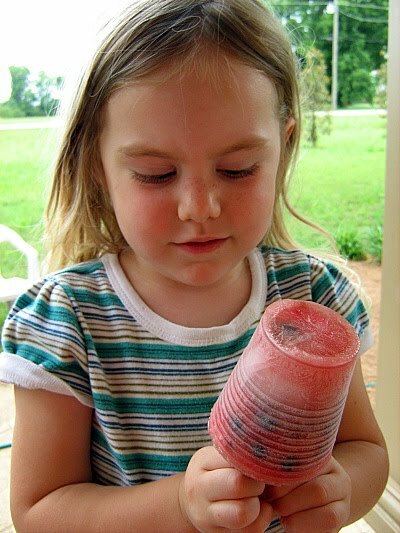 Distribute the blueberries among six 8-ounce popsicle molds or paper cups, then fill each with the watermelon mixture and place in freezer. 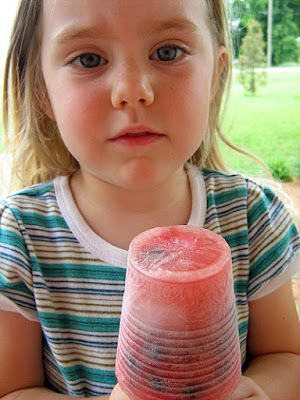 If using paper cups, place a popsicle stick in the center of each cup after a 1/2 hour in the freezer. Allow to freeze completely, about 4 hours. When I am asked to provide dessert for something in the summer, I always think of desserts that include fruit. 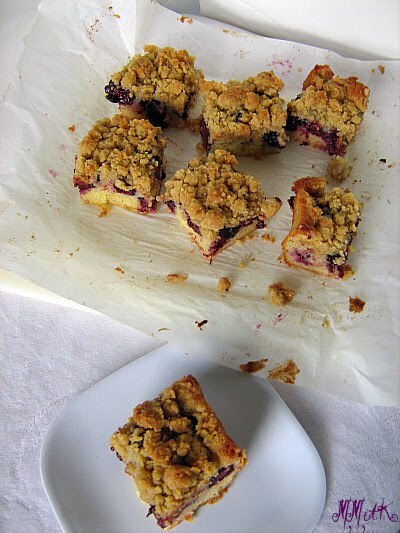 I decided on these 2 quick and easy fruit bars which showcase blackberries and rhubarb. A couple of weeks ago I bought a large amount of rhubarb, because I knew it wouldn't be available much longer. I brought it home and chopped it, so that I could put in it in the freezer and use it later. 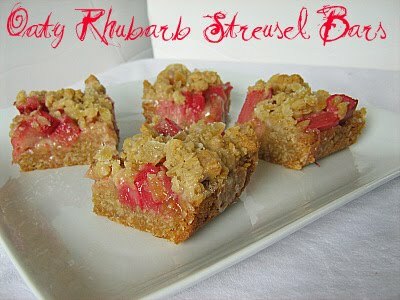 I used some of the rhubarb in these Oaty Rhubarb Streusel Bars. The base is a basic oatmeal crust/crumble, of which some is reserved to be the crumbs on top. The base is baked for a little while and then the rhubarb is added. The rest of the crust is sprinkled on top and then a ginger icing and crystallized ginger are sprinkled on top. These bars turned out looking so delicious. I didn't get to taste one, but there weren't any leftovers, so I can only assume they were great. 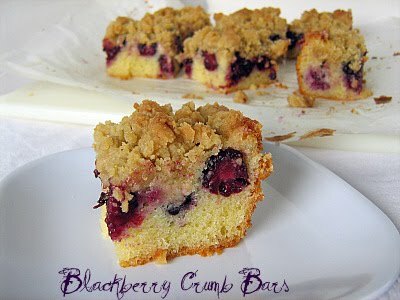 The Blackberry Crumb Bars had a cake-like base, then the blackberries were placed on top and a separate streusel was sprinkled on top. These were a little bit more difficult to cut, so my kids and a friend were able to sample one of the pieces that fell apart. They said it was delicious. My kids were begging for more, but the rest had to be whisked away! 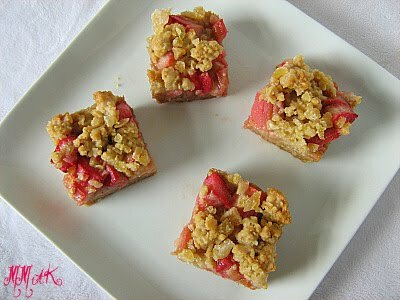 If you are looking for an easy fruit cake/cookie streusel bar, try one of these!